Purchase the ultimate gift and present an opportunity for your friends via A' Design Awards' Gift Cards. 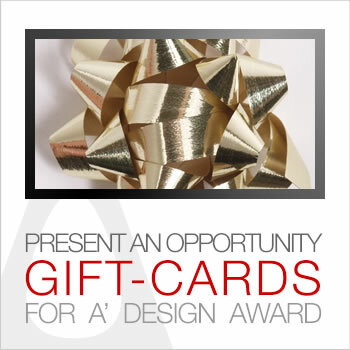 One of the most exquisite gifts you could give to your designer friends and fellows is the A’ Design Award & Competitions’ Gift Cards. Designers, who are on a constant quest for aesthetic perfection and beauty in their works, can be picky when it comes to gifts. Each designer has a unique style and perspective on life, making it harder to choose the right gift. Truth be told, there are a plethora of advice and a paucity of assistance when choosing the best gifts for designers. If you offer them an object, designers look for details and quality of craftsmanship as well as originality and scarcity: designers prefer objects that are well designed, creative and imaginative but also exclusive. Best gifts for designers are usually those which ignite imagination or those that could create a strong emotional reaction. Experts and gift guides therefore market the following gift ideas for designers; tools for designing better, designer toys, designer gadgets, designer jewelry and any other handmade or limited edition products made by other designers or design oriented companies. On the top of the Maslow’s famous hierarchy of needs, you will find “creativity” which all designers need to satisfy for their self-actualization, therefore the perfect gift for a designer is not an object but rather an experience that could ignite and boost creativity, help them achieve self-esteem and confidence. The perfect gift for a designer could be a reward for their talent, recognition of their work, but of course it could be a gift card as well. There are two A' Design Award Gift Cards: The Ultimate Gift Card and the Digital Edition Gift Card. 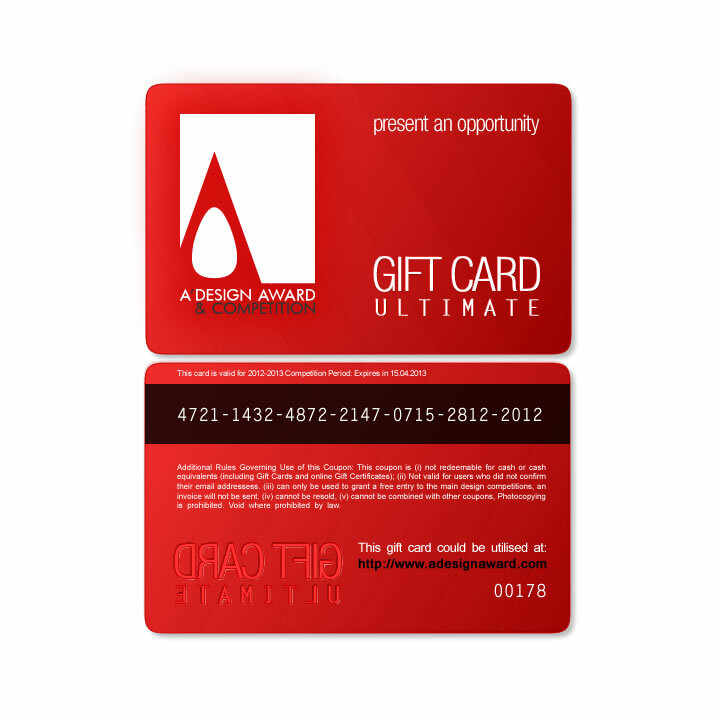 Each A’ Design Award & Competition Ultimate Gift Card includes three items; first, a processing fee waiver ticket for a single design nomination to A' Design Awards and two services to be activated for this nomination (Express Judging Service and Professional Preliminary Evaluation and Judging Service). Regularly, when purchased separately, all of these services combined could cost higher, however, to make it a perfect gift, we have compiled and combined these options under one single package, and the package is presented with a discounted fee regardless of the competition period. The Gift Cards could be also used for yourself - an extra litte something to help motivate you start designing!, or by your friend; the greatest gift a designer could ever get, or for your business; an opportunity to advertise and deduct taxes at the same time! Winners are offered; In addition to the award winners’ kit which includes the award trophy, the annual yearbook, printed certificate in metal frame, award winners manual, free gala-night invitation for two people to the award ceremony, free participation and space allocation in the winners' exhibition, free sales listing at SaloneDelDesigner, free utilization of DesignMediator services, inclusion in BuySellDesign Network, proof of creation service, free subscription to listof.net, free listing at DesignMegaStore, guaranteed publication through IDNN and DXGN Networks to 100+ magazines including Design Interviews & DM Design Magazine, press release preparation and distribution through DesignPRWire and other services, publicity and visibility through DesignMedia communications, feedbacks, judging and evaluation of entries by a respected jury panel, lifelong licensing of the award winners logo, A2 poster design and printing for exhibition, and many others such as inclusion in the World Design Rankings, all of which are provided with no further fees, the award also offers designers an extensive and intense publicity for their award winning designs. To purchase this gift card, click on the "Purchase Gift Card" button below and simply complete the transaction by following the instructions on the new page. After your purchase, your designer friend can directly proceed to upload her designs, and use the ticket code that will be sent to you for completing the nomination process without the need of any further payments, in addition your friend will receive the afore mentioned services automatically. If you are registered and logged-in, your details will be filled for you. To purchase this gift card, please click the button below. Digital Gift can be used by Professionals, Young Designers, Media Members, Academics and Design Association members but not for Agencies, Governments, Non-Profits or Enterprise Account Types. Notice: Gift Cards include nomination tickets which are pre-paid nomination waiver coupons that could be used until the competition deadline to waive entry fees during nominations. If you purchase a gift-card now, it could be used within one year, until the late-entry deadline to nominate one design project to A' Design Award. Once purchased, your nomination ticket and usage instructions will be emailed to you along with the invoice. To purchase a Gift Card, which includes a Nomination Ticket click the button above. By purchasing this ticket, and using the provided code after purchase, your friend will be able to by-pass the nomination processing fee payment for her submission. You can transfer this ticket to any entity for participation, but refunds will not be possible due to our accounting regulations and practices. Please also remember that your friends need to agree the terms and conditions of A' Design Award & Competition in order to utilize the ticket included in the package. The Digital Edition Gift Card costs significantly less and allows any designer to make a free entry to the A' Design Award & Competitions' Digital Edition which differentiates from the Professional Edition for it's eligibility and winners' kit. The Digital Edition Gift Card also includes the Express Judging Service which is included in the Ultimate Gift Card but does not include the Professional Preliminary Evaluation and Judging Service. Before buying this card ensure that you learn more about Digital Edition and compare it to the Professional Edition. Digital Gift can be used by Professionals, Young Designers, Media Members, Academics and Design Association members but not for Agencies, Governments, Non-Profits or Enterprise Account Types.